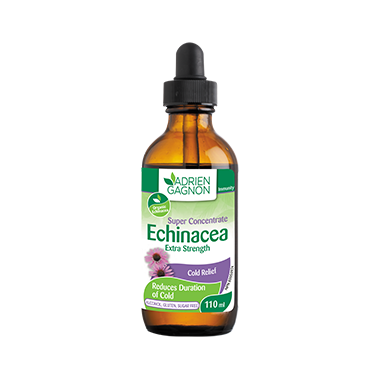 Echinacea, like in this Adrien Gagnon Liquid Formula, is used in herbal medicine to help relieve cold symptoms. Dosage: Take at the first sign of infection, with water. Children 2 to 4 years old: Take 1 ml, 1 to 2 times daily. Children 5 to 9 years old: Take 1 ml, 1 to 3 times daily. Adolescents 10 to 14 years old: Take 2 ml, 1 to 2 times daily. Adults and adolescents 15 years and older: Take 3 ml, 1 to 2 times daily. Note: Liquid as the benefit of fast absorption. Contains no alcohol, sugar or gluten. 100% organic. Precautions & Adverse Effects: If symptoms persist or worsen or for use beyond 8 weeks, consult a health care practitioner. Consult a health care practitioner prior to use if you have an autoimmune disorder, a progressive systemic disease such as tuberculosis, collagenosis, multiple sclerosis, AIDS and/or HIV infection, or if you are taking immunosuppressants. I'm not convinced this actually works. I've had a cold for a few days and have been taking it, but the cold seems to be running it's course. The price was good and it doesn't taste like anything which is good, so you could add it to plain water if you wanted to. I don't think I would purchase again just because I'm not sure it did anything for me. Great product! Cheaper and better than other. Always check the ingredients!